In 1956, at age eleven, Bill learned his first song "Davy Crockett", leading him to fall in love with guitar. He constantly listened to Duane Eddy, Chet Atkins and Roy Clark. By 1958 he was very interested in being involved in music as he watched his father play and practice with his bands. Bill's father (Del) had bands in Lubbock/Texas, Phoenix/Arizona, Albuquerque/New Mexico and a live radio show featuring live bands every Saturday afternoon. His father would play Saturday nights at local clubs and then usually the musicians would gather at Del's house for jammin' and food with the music continuing in to late Sunday afternoon. Bill's father's band often backed various stars, allowing Bill to meet people seen on television or heard on the radio and juke box. In 1960 while living in Albuquerque, Bill's parents, on numerous occasions, were invited back stage at the traveling "Grand Ole Opry" shows. Bill got to open and close the curtains and take care of the performers guitars etc..., fueling his desire to perform even more. Bill got to meet Faron Young, Wayne Kemp, Hank Snow, Carl Perkins, Johnny Cash and many others. Bill went in the Army and continued to practice, trying to play "like Chet". In 1965, after getting out of the Army, Bill had numerous jobs. A mining job led Bill to California. He often went to the "Nashville West" club and even tried out for a job as a lead player. He didn't get that job but it didn't stop him from continuing to pursue a music career. In 1967 he moved to Bakersfield where he met Dennis Payne, Red Simpson, Garn Littledyke, Ronnie Sessions and others as he sat in at jam sessions around the area. Bill found Bakersfield in the 60's to be exciting musically. 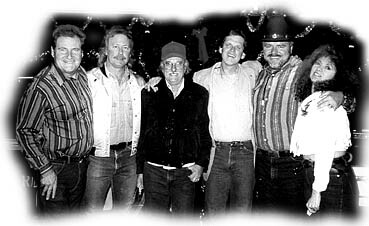 Once while Bill was at Kay Adam's (a musician and singer) house Vern Gosdin brought over his new release of the Gosdin Brothers "Hangin On". "The music scene was exciting in Bakersfield. Somehow I met Dennis Payne. His girlfriend Jeanie O'Neil and Kay Adams were good friends. 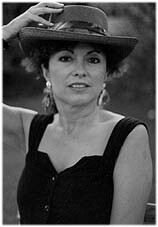 Kay Adams was a friend of Buck Owens' manager and sang on a local show. Often there would be parties at her house on saturday afternoons after she and "The Gosdins" and Red Simpson to name a few were on the show. I got to hang out with them and go to jam sessions, at that time I also played bass just to get stage time with these great entertainers. One Saturday afternoon Merle Haggard's bass player came in to "Tex's Barrel House" and sang a song Haggard had just recorded, it was "Hickory Hollers Tramp", that was a thrill. It was at this same time that Dennis was recording at the "music bag". A combination music store and recording studio. It was owned and operated by Gary Paxton. Watching him work in his control room was an experience. It was set up in an old bus, parked out back. Somehow you could see the artist's playing through the window. Dennis was doing an instrumental. Later on the road the song was played on various stations around the country. That was in 67." Jim Rich & Gene ? In 1968 Bill went back to Albuquerque. While playing in New Mexico, Jim Rich came through looking for a guitar player. 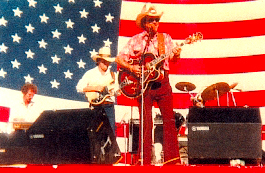 Bill spent the next couple years on the road playing lead with "Jim Rich and the Country Coins". In 1970 Bill started his own group called "Country Funktion". He continued on the road until he settled down in Albuquerque in late 1972. He played at the top country western clubs and honky tonks around Albuquerque. Albuquerque was a great country mecca at the time. 1975 Bill recorded with his Brother Kurt Kelley. This single was released on "Cristy Records". 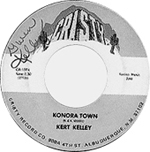 "Konora Town"written by Bill & Kert Kelley. "I Don't Think We Can Make It Very Far" written by Mike Seigling. This is the only thing Bill did with his brother together on record! Note: Kurt's name was Wendell Curtis Kelley. He changed it to "Curt" later "Kert" and then "Kurt"
Bill played behind some of the top country stars like David Frizzell, Bobby G. Rice, Buddy Allen, Rex Allen Jr., George Morgan, Hank Thompson and Dennis Payne were a few of them. 1977 through 1981 Bill played with his brother's band. 1983 Bill recorded an album with Bud Strong and Frank Peavey Wells as "Hawkeye". Bobby Rhodes on five string fiddle, Rick McGrath on pedal steel. Bill Kelley: These ten songs are just a glimpse of Bill's versatile and spontaneous style for arrangement. He has a way of getting down to gut level with the feeling of every song. This, in combination with Bill's tutelage by such as Johnny Collinsworth, Jay Dugas and the influence of Chet Atkins style at an early age and many years in the business bring you the incomparable sound you have here. Bud Strong:Bud joined the HAWKEYE group less than a year ago. Many other local musicians played with the group, but Bud was chosen because of his talent and attitude. Not only does he sing three songs on this album, he also wrote them. They have a lot of meaning and as you listen you are aware he has added a few pages to the book of life and the school of hard knocks. We're glad he settled down and joined our family. Frank Peavey Wells: Here we have the cornerstone of HAWKEYE. Besides providing the foundation for each song you're hearing, Frank is also the founder, manager, booking agent and head PR man for the band. With experiences running from Bourbon Street to the Black Hills of South Dakota, Frank has seen life as it is, and enjoys it to the fullest. In 1982 Bill started his band "Nite Rider". 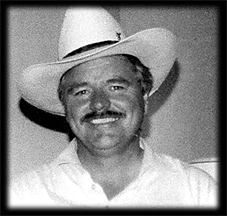 He played all the best jobs around Albuquerque, local night clubs, state fairs, rodeos and private parties. Members of the early years were Bill Kelley, Kert Kelley, Bud Strong, Frank Howard, Phil Howard. 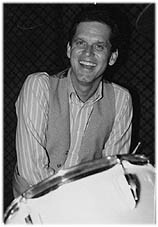 The first year they hired many drummers until Richard Martin came along. Note: Bill Kelley's dad had a band named "Arizona Niteriders" in the 50's, that's where "Niterider" came from. It's a cowboy that rides herd on the cow's at night, he will sing cowboy songs to sooth the cattle. "Second that emotion" - written by Bill Kelley. Lead vocals by Franie Howard. Bill Kelley lead guitar and Frankie Howard on steel guitar. Note: John Wagner did a lot of stuff over the years, Bill's dad recorded there in 1967, he also did Merle Travis and Joe Maphis' last record. 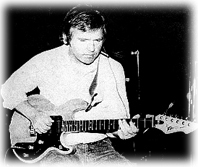 John Wagner also produced the first Swampwater album with Gib Guilbeau released 1970. 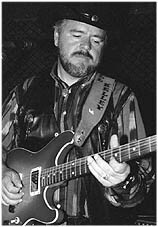 In 1986 Wayne Moore joined Bill's group "Nite Rider". They played western swing, new country, old country with 4 part harmony and even expanded in to comedy with Wayne Moore. 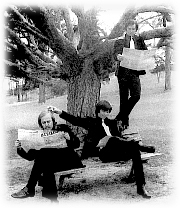 For many years the band had a great sound and a large following of fans. Edna Seifert (later married Richard Martin) & Wayne"
Members of Nite Rider came, went and came back over the years. They included Wayne Moore, Edna Seifert (now married to Richard Martin) Richard Martin, Frankie Howard and his brother Phil Howard, Bud Strong, Jimmy Kennedy and Fred Mullerude. They opened for many country stars including Steve Wariner, Little Texas, Eddie Raven and the country comedy duo Williams and Ree (The Indian and the White Guy). There were about 7 to 10 musicians that played with the band, but the base of the band was Bill Kelley, Edna Martin and Wayne Moore! 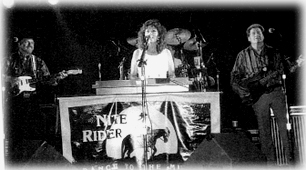 Nite Rider was quite popular in New Mexico as they entertained in various venues. Bill spotlighted each musicians versatile talent by having them switch instruments on stage, adding to the crowd's delight. Wayne's "Elvis" show, fiddle tunes and comedy act were special highlights. 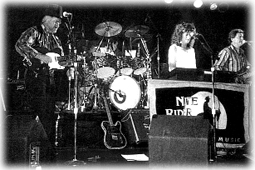 Around Christmas 1994 "The Nite Rider Band" was playing in a club out in the mountains. An old log cabin in the pines called "The Ponderosa". Gib Guilbeau was playing with the band that night. 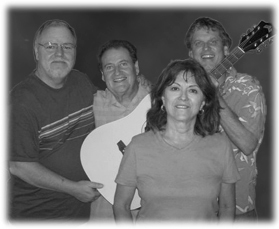 The picture is Wayne Moore on bass, Phil Howard doing lead vocals, Gib Guilbeau on fiddle, Richard Martin on drums, Bill Kelley on electric guitar and Edna Seifert on vocals. (Note: Edna Seifert married Richard Martin summer 2001, now Edna Martin). Also playing that night on bass was an old friend of Wayne and Bill "Skip Bacheler". Wayne invited him out to the club there, he is an old "Burrito" fan and wanted to set in. Around 1997 the Nite Rider Band recorded a few songs. Wayne, Bill Kelley and Joanne Kamp wrote "Hero to zero", it was a song Bill had written. Wayne re-wrote the second verse and Joanne did some lines in the last verse, Wayne played all the music except the lead, Bill played that, then Wayne and Joanne did all the backup vocals and arrangement. Bill wrote "Whisky" and played lead, Troy Moore sang harmony, Wayne did all the rest. These songs and a few more were never released! Mostly the music they recorded in Wayne's studio was for promoting Nite Rider and practice. The reason why we recorded it was Wayne and Joanne asked me to play lead on a song they were working on, I said I'd love to, all I would ask in return is that Joanne sing "Hero to zero" for me, she did and it came out great. There is about six songs we were working on, Wayne did "Blue suede shoes", I did "Whisky, I'm gonna put you out of my misery" Edna did "Keep me from blowing away", Joanne did "Hero to zero", there was another band member then, Fred Mullerude, he sang an original song, and we did a medley of old rock songs. Then Fred left and Richard Martin took his place as drummer". Halloween at "Rio Rancho Country Club"
Nite Rider Band with members of "Little Texas"
There is an interesting story of Bill Kelley and Wayne Moore's paths crossing over the years. While Bill was living in Bakersfield and trying to break in to music, Wayne was also living and working in Bakersfield. They traveled in the same circles. Wayne was doing recording sessions at Gary Paxton's studio at the same time Dennis Payne was. Bill went to the studio with Dennis (Dennis Payne stayed at Bill's house while in town) numerous times. Many years later Bill went to a local club in Albuquerque to hear his brother Kurt's new band. Bill sat in on guitar. After Bill left the stage, Wayne Moore (who was at that time playing bass for Kurt) asked "who is that guitar picker and where did he come from". Wayne wanted to play more with Bill and told Bill that if he ever needed a bass player, he wanted the job. 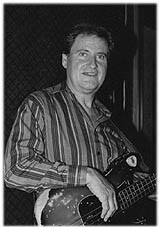 A couple years later Bill needed a bass player and looked up Wayne Moore. 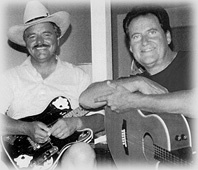 Wayne was on the road playing with Vern Gosdin (at the time in Laughlin/Nevada). Bill called Wayne in Laughlin, offering him the job. 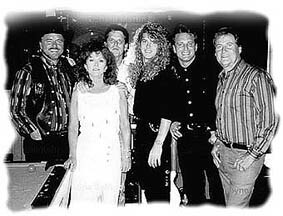 Wayne arrived ready to play with Bill two weeks later.After Wayne started playing with "Nite Rider", Bill was at Wayne's studio and noticed a picture of Wayne, Glen Campbell, Charro, Jack Reeves and Chuck Willis. Bill asked Wayne how he knew Chuck Willis. They started comparing notes and discovered that they had been in all the same places at around the same time, and must have met or at least had seen each other before. Wayne played bass for Chuck Willis and Chuck was Bill's brother in law at the time!! Through music, Bill and Wayne met, became and still are great friends. 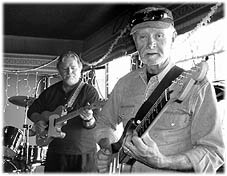 Bill went to a jam session with Johnny Hogan 2003. Bill: "We had a blast!!!" (center picture). Many thanks to Bill Kelley and Wayne Moore for their great help!